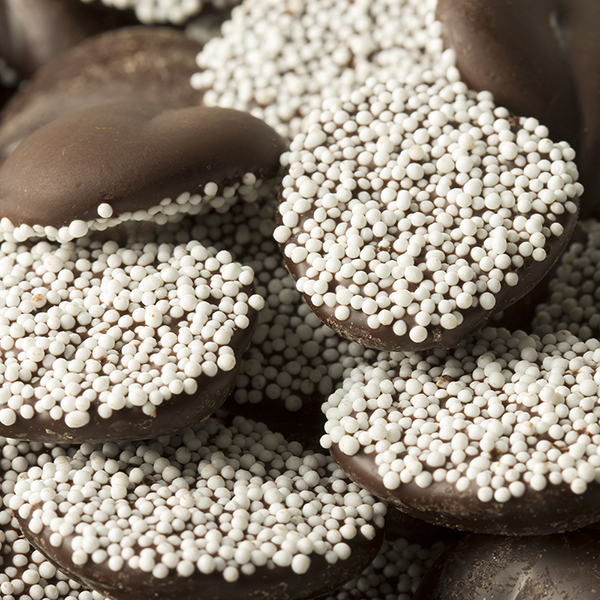 Rich Dark Chocolate Non-Pareils (White Coating). NUTRITION FACTS: Serv. Size: About 1/4 cup(40g). Servings: About 6. Amount Per Serving: Calories 200, Fat Cal. 100, Total Fat 11g (17% DV), Sat. Fat 7g (35% DV), Trans Fat 0g, Cholest. 5mg (2% DV), Sodium 0mg (0% DV), Total Carb. 26g (9% DV), Fiber 2g (8% DV), Sugars 20g, Protein 2g, Calcium (2% DV), Iron (10% DV). Not a significant source of Sodium, Vitamin A or Vitamin C. Percent Daily Values (DV) are based on a 2,000 calorie diet. INGREDIENTS: SUGAR, CHOCOLATE LIQUOR (PROCESSED WITH ALKALI), NONPAREIL SEEDS (CORN STARCH, CORN SYRUP), COCOA BUTTER, MILKFAT, CONTAINS 0.5% OR LESS OF THE FOLLOWING: SOY LECITHIN (AN EMULSIFIER), VANILLIN (AN ARTIFICIAL FLAVOR), NATURAL FLAVOR, VANILLA EXTRACT. I Love Dark Chocolate and have never tasted any non-pariels as good as Fastachi's. Very delicious dark chocolate non pareils! They arrived in a timely manner and well packaged. We will be ordering more in the future. Can not say enough about these non-pariels,have purchased them allot of places but none are like Fataschi's. Thank you. These were a gift to my sister along with other items. I wanted to give her a touch of the East Coast where we grew up. She said they were heavenly... and those words don't come easy from her. I really had to search and read a lot of reviews before I could get just the right place that makes non-parelies. I hit the nail on the head. These are going to knock my mother out with their goodness. Buy them, eat them, feel free. Mar 29, 2014 | By Pamela C.
The VERY BEST I have ever tasted,Excellent! !